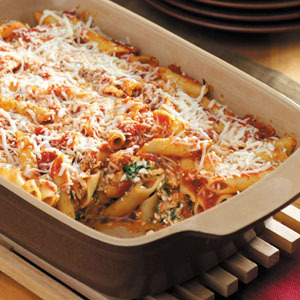 Preheat the oven to 350 and cook the box of mostaccioli noodles. Brown the hamburger and sausage and cook for 15 minutes. Drain fat. Combine sauces (reserve 1.5 cups for the top), garlic power, Italian seasoning, mostaccioli noodles and all but one cup of the cheese. Mix. Place reserved sauce and cheese on the top. Bake at 350 degrees-Uncovered for approximately 30-45 minutes until the middle is hot.